Shop the Build Your Library Spring Sale! Spring is slow in coming to New England, but I can finally see it taking hold. The snow is melting, the air is getting warm and that sweet smell is back in the air that means Spring is right around the corner. This is a time of waking up, going out into the sunshine and for homeschoolers, thinking about their next school year. 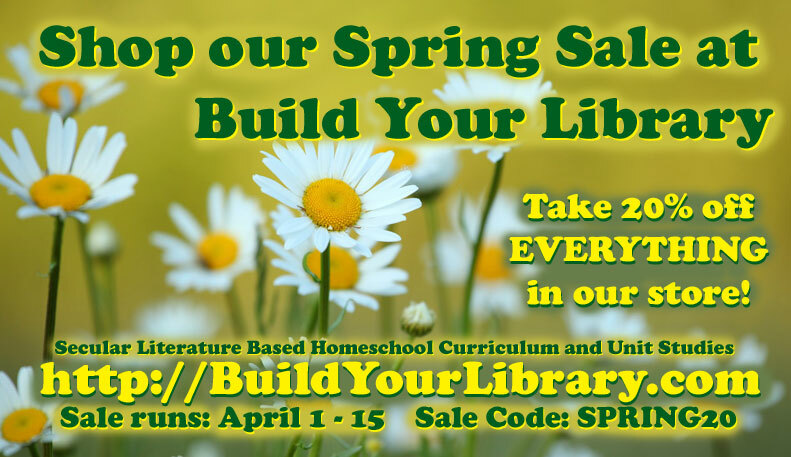 Which is also an excellent time to buy Build Your Library curriculum, especially during our 20% off Spring Sale! Why not check out one of our programs for your next school year? We currently offer full year lesson plans for Grades K – 7. Each year of lesson plans includes a full daily and a weekly schedules, your reading list, our exclusive Narration Cards, copywork/dictation passages, discussion questions and other activities based on the literature you and your child are reading. There are also timeline figures, research projects, art and science lessons and so much more… All you need to add is math and grammar! Now is also a great time to dive into one of our unit studies! We have a wide variety of units ranging from literary titles (The Hobbit, The Harry Potter series) to science (Darwin and Evolution, Sharks) to History and Holidays (Prehistory, WWII, The History of Thanksgiving, Winter Holidays, Jan Brett Christmas). There is something for everyone! Every unit comes with a full schedule, reading list, and a wide variety activities, from map work and writing projects, to art and science experiments to cooking and baking. There is more than enough to keep you and your child engaged in learning! Just use the sale code: Spring20 at checkout to take 20% off your entire order. You can shop as often as you’d like, just be sure to purchase by April 15th to take advantage of the sale! Happy Spring everyone! Don’t forget to spread the word!